System with four roadways/carriageways, where access ways primarily connect with the outer roadways. Through traffic on the inner carriageways can flow without interruption. Local and express lanes can be connected using a basketweave. The local-express lane system is an arrangement of carriageways within a major highway where long distance traffic can use lanes with fewer interchanges compared to local traffic which use 'local' or 'collector' lanes that have access to all interchanges. This can also be called collector–distributor lanes within a single interchange. Where highway ramps between express and local/collector lanes cross over one another this is commonly known as braided ramps. One of the longest examples is Ontario Highway 401 between Etobicoke and Pickering in Canada. Given the considerable overall width of this design, new suburban freeways are often designed with interchanges spaced far enough apart to avoid the need for parallel roadways. This concept is different from Express Toll Lanes. The following examples include both local-express lanes and collector-distributor lanes. Ontario: Highway 401 in Peel Region, Toronto and Durham Region. From Beylikdüzü to Cevizlibağ on the European side. From Ünalan to Bostancı on the Asian side. From Kartal to Pendik on the Asian side. Izmir: D.300 from Halkapınar to Kemalpaşa in Izmir. Malatya: D.300 through the city center of Malatya. Nevada: Interstate 15 in Las Vegas, between Russell Road and Sahara Avenue (opened to traffic October 2009) and between Blue Diamond Road and Russell Road (northbound opened to traffic November 2011 and southbound currently under construction). North Access freeway over National Route 9. The express lanes (left, all vehicles) and local lanes (right, cars and buses only) are clearly seen on this photo that shows the view towards the north, from the bridge on Melo street, at Florida, Vicente López, Buenos Aires Province, Argentina. Speed limit signs for each lane, indicating speed limits of 130, 120, 120, 110, 100 and 90 km/h, can be seen at the bridge. A bus priority lane can be seen at the right side of the yellow line in the local lane section. Express and local lanes of Leningradsky Avenue in Moscow, Russia. Express and local lanes, M-30 circular highway in Madrid, Spain, east section. 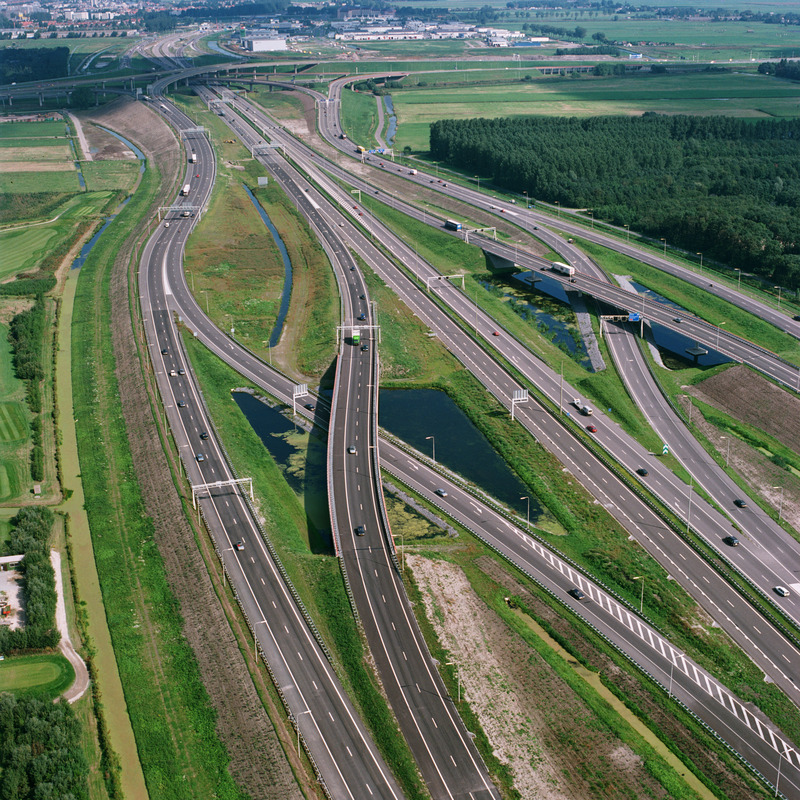 A4 The Hague and near Schiphol Netherlands have a basketweave braid in between two adjacent interchanges. Section around Leiden as well. M1 West Gate Freeway, between the M2 and Burnley Tunnel in Melbourne, Australia. M1 Warringah Freeway, between Miller Street and the Bradfield Highway in Sydney, Australia. North–South Expressway Northern Route, between Jelapang and Ipoh South, Malaysia. Prof. Dr. Ir. Soedijatmo Toll Road, between Pluit and Penjaringan, Jakarta, Indonesia. Express to collector transfer on Highway 401. M20 motorway near Maidstone, England, showing separated local express lanes. Local-Express lanes on Interstate 270 in Montgomery County, Maryland. Collector-Express roadway configuration on Highway 401 in Toronto. A cloverleaf interchange may have collector–distributor lanes on a freeway or expressway to handle entering and exiting traffic. Usually, this lane will begin as an entrance-only ramp initially, but it will sometimes become a main lane or possibly an exit-only lane. The purpose of this lane is to facilitate traffic to the freeway exits and from the freeway entrances. ^ VDOT: Braided Ramp Demo. YouTube (2009-02-26). Retrieved on 2013-07-16. ^ I-5 196th Braided Ramp animation. YouTube (2010-12-02). Retrieved on 2013-07-16. ^ WSDOT - Project - I-405 – NE 8th St to SR 520 Braided Ramps – Interchange Improvements - Complete May 2012 Archived 2010-07-10 at the Wayback Machine. Wsdot.wa.gov. Retrieved on 2013-07-16. ^ TxDOT IH-10 Section 3. PGAL. Retrieved on 2013-07-16. ^ State Route 180 Braided Ramps Project. Dot.ca.gov. Retrieved on 2013-07-16. ^ Tele Atlas. "Driving directions to King's Hwy 401/MacDonald-Cartier Fwy". Google Maps. Mountain View, U.S.A.: Google Maps. Retrieved 2009-04-28. ^ Tele Atlas. "Driving directions to King's Hwy 401/MacDonald-Cartier Fwy/Hwy of Heroes". Google Maps. Mountain View, U.S.A.: Google Maps. Retrieved 2009-04-28. ^ Tele Atlas. "Driving directions to Unknown road". Google Maps. Mountain View, U.S.A.: Google Maps. Retrieved 2009-04-30. This page was last edited on 15 April 2019, at 23:09 (UTC).